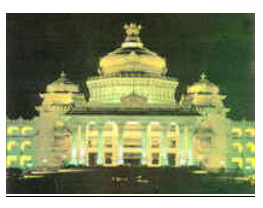 Vidhan Soudha is the imposing building housing the Legislature of Karnataka state. In sheer beauty and style, this building is matched only by the Victoria Memorial building in Kolkata. Combining the best elements of British and Indian classical (Dravidian) architecture, its builder, Sri. Hanumanthaiya constructed this granite building between 1951 and 1956. The construction cost Rs 1.84 crores (1 crore = 100 million). The building is situated on 60 acres of land, has three main floors and has a total floor area of 505,505 sq ft. Its overall length is 700 ft; width is 350 ft; and at the central dome the height is 150ft. The architect employed 5000 laborers an 1500 chisellers, masons and wood carvers. The construction used granite, steel, reinforced cement, concrete, glass and even plastic. Unlike modern constructions in India, this building has intricate carvings, arches (‘Chaithya arches’), cornices (‘Kapotha cornices’) etc., and these account for its classical appearance. The building is roughly rectangular is shape, with 12 pillars 40 ft in height each at the northern entrance. An imposing dome crowns the central section. This dome is 60 ft in diameter and has a replica of the four lions that form the state symbol of India, at the top. There are two open quadrangles within the building, one on either side of the central wing, each measuring 230x230 ft. There is a banquet hall on the ground floor of the Central Wing. The Legislative Assembly Chamber is located on the first floor of the central wing and is just above the Banquet Hall. It is 125ft x 132ft, 40ft, and it seats 268 members. 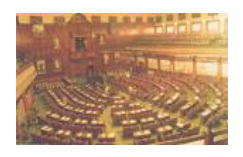 The Legislative Council Chamber is located on the first floor of the southern wing, is 100 ft x 78 ft and seats 88 members. 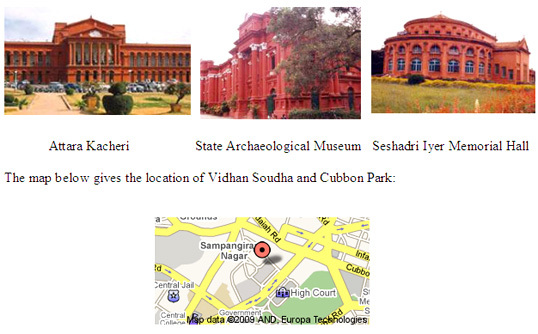 Vidhan Soudha is located in Cubbon Park; some other important structures in Cubbon Park are Attara Kacheri (High Court), State Archaeological Museum and Seshadri Iyer Memorial Hall.